I do know about Lux as I have used BlendLux...Blender and Lux which does the same as Reality a bit. But with my computer I can't do big scenes. Let me retract the info about Global Illumination and ambient surfaces as it is not working like it used to in my testing just now. Area lights work though. Sorry about that. That will teach me to test first before opening my mouth. :) Off to test some more then make a bug report if needed. What do you mean by 'area lights'? Daz only gives me 4 types of lighting, and the shader based UberEnvironment. The only other lights I have are specific to Reality. 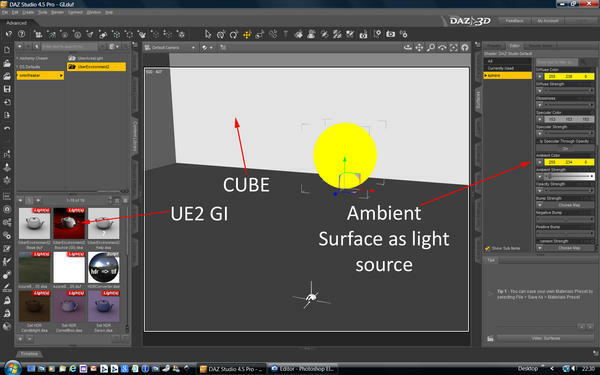 DS3 and DS4/4.5 have always had mesh based lighting called Area Lights...there are found under Daz Studio Formats/My Library/Light preserts/omnifreaker/Uber Area Lights right above UberEnvironment 2 in the Content Library Pane. You can use any mesh for a light source providing the normals are facing the right way. 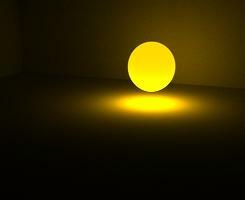 So on a newly loaded sphere thr light is projected outward. You can adjust the light, fall off, shadow colour and intensity all from the surfaces pane. OK the UE2 GI preset works with Ambient Surfaces as light sources but to be honest for the render time being sooooooooo long I would stick with Lux. But I am happy to get some info together on Area Lighting but again with my computer Area lighting takes a long time to render so I can explain the functions just not show it visually very well. Area lighting is my favourite lighting by far for the softness it produces. Plus we can fake things a lot more with Shadow colour and intensity controls and fall off. Ok here is how to make light using surfaces and UberEnvironment 2 Global Illumination (GI) Preset that is included in DS3/4 and 4.5. Warning do not attempt this if you have a lower powered computer or if you don't want to wait days for the render to finish. This would be true for Lux on my system. The rendered image below took 3 hours at that small size and it still came out a little grainy so I reckon 4 hours. And all there is in the scene is one Cube and Sphere. Anyways for those you may want to try it or have a computer than can achieve these advanced features read on. In the image below I refer to Super Sampling...this is when the shading rates are lower than 1..1 being one sample for each pixel....meaning the render engine calculates the surface properties once per pixel. With many of these lights with Indirect and Global lighting need more sampling to reduce the grain. Using a sampling rate of .10 we are sampling each pixel 10 times...here I used 0.01..100 samples per pixel and it still has a touch of grain left. All In did here was load a 10 mtr Cube and a 1 mtr sphere. Camera inside the cube..left the surfaces of the cube as loaded, the sphere changed the diffuse colour and ambient colour and strength and that is all. Loaded UE2 GI via the preset. Now if you load the normal UE2 and switch it to GI in the parameter pane this isn't going to work...you must you the preset. Tomorrow if I get a chance I will show how Area lights work. Do you know Daz Studio has primatives? As in primative geometeric shapes...I used Spheres. I have no idea what primatives are. There are still a lot of menu items and tabs that I have not figured out yet, but I'm getting to it. 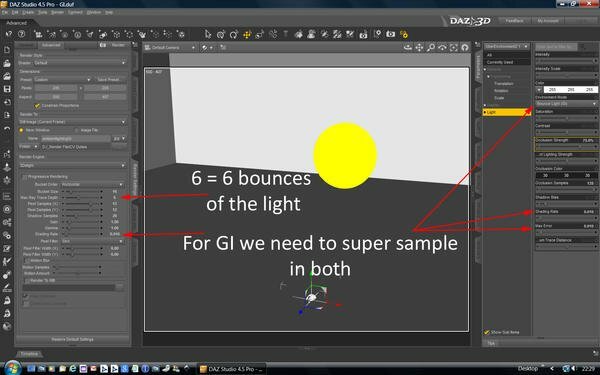 Ok here is how to make light using surfaces and UberEnvironment 2 Global Illumination (GI) Preset that is included in DS3/4 and 4.5. So THAT'S what those tea pot icons are for. LOL. Anyways I was going to get some info together about Area Lighting but alas my day has not been kind to me again. I did get an example rendered last night but I haven't typed anything up or taken screenshots etc etc. All being well tomorrow. As for what the tea pots are...noticed the second icon labled "Help", great place to start for anyone learning this stuff. I don't really get into Christmas but if I did I think this would be enough. All I want for Christmas is a big hug. No background yet (which makes it look odd). The composition is probably not so good (I read but didn't apply--yet--the advice in this thread about the rule of thirds,etc.). * This render is sort of a proof-of-concept piece, but as such I'm pleased with it so far. Before I spend hours, does anyone seriously want to learn about Area ligthing? As lighting is a key point of any good render, I'd find it very useful to get as much information as I can. I'm getting somewhat comfortable with basic and UberEnvironment lighting, but I'm still a complete newb when it comes to area lights. A lesson would certainly be appreciated if you have the time. 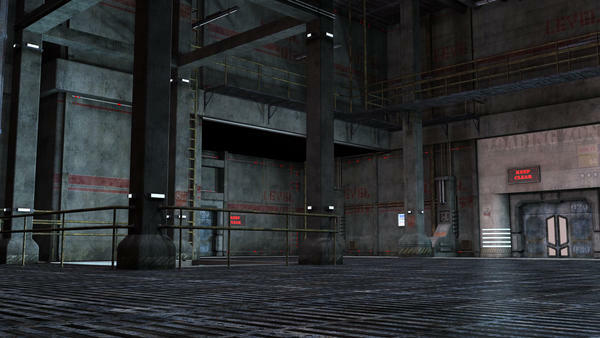 The biggest problem I had with area lighting was getting them to work without crashing 4.5. I found a thread in the Commons that suggested turning off Progressive Rendering when using them and haven't had a problem since. My image above (I want a hug) was done with area lighting (using IG Lighting Studio) and the one bellow was one of my first experiments in lighting a big scene using only area lighting. 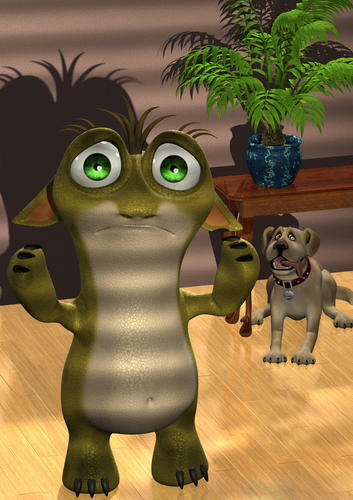 My advice to other new users is that they are applied and used just like any other shader in Daz and experimenting with them is the best way of learning. Two things to watch out for are the diffuse and ambient channels. When you apply the shader to the surface you will have to reload the diffuse map (if there is one) and the ambient channel is turned off by default so you have to readjust it to your needs. Thanks Szark for all your hard work in putting together this thread and all your examples and mini-tutes. 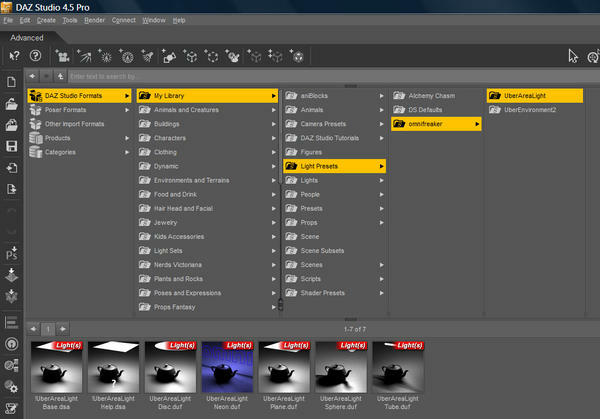 If you remember the name of the texture map then it should be listed when you click on the diffuse map channel box. This tutorial has grown to be a biggy so I might put it in a thread of its own. Been working all day on getting some simple renders done and screenshots of the settings, typing up stuff while rendering. Just one comment. 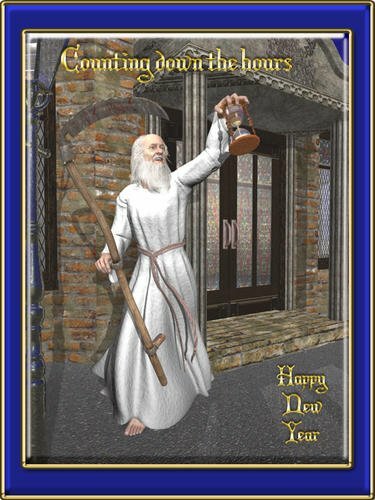 We are seeing some great renders here, but there are some that don't really seem to be "Holiday Cards" to me. Thanks Chohole for that. I did have in mind to mention it then forgot due to having my head in another long tutorial making session and yes nice card..no very nice card indeed. Area lighting tut is coming on nicely and won't be done until after xmas now. I will have to post it to a thread of its own, probably in the New Users Section. Bluemoon I found something strange the other day, I loaded an Area Light Sphere, left Ambient OFF and I got light so I tested and retested and the same result will all Area Lights. This is so new to me too I have always had to turn ON the ambient channel to get light. As for the contest I like all the WIP posted so far as WIP and all have great potential. The reason why Composition was included in this months comp was so you would hopefully think about where you place your subject matter and other elements like text and other scene props. You may find it helpful to take a step back and sit down with a cuppa and just and look at it for a while. Go away for a few hours or a day and sit down and look at it again. Doing this helps me when I get image blindness. :) And sometimes I see where I have gone wrong and adjust things. Well, I took my original design back to brass tacks, made some big changes with the lighting and decided to render it in 3Delight rather than Lux. The main reason is that despite my best efforts (and over 3k samples per pixel) there's still a ton of fireflies and other grainy bits which are as stubborn as a donkey. The other reason is that I wanted to try something different with the lighting to see what effects I could come up with. I made an attempt at brightening the christmas tree using area lights (turning each of the bulbs into a light source of sorts) and the result was.. well, it was unique. That being said, I've got a good setup which allows me to play around with various aspects of the lighting a lot easier than before, so hopefully I'll be able to tweak it to my liking. As an aside, I had to change the parents to look at each other. The depth of field does funny things to 3Delights rendering and made them appear as they were staring into space, or looking up when they were in fact looking down. As for where I am currently, here's an image of my recent 3Delight venture. It's interesting the kind of differences there are between this one and the one at the bottom of page 4. That one showcased the tree's lighting while this one has a strong central focus where arguably neither is a "wrong" idea. The focus was always supposed to be on the kids, but I got carried away with wanting a more realistic approach to the christmas tree lights. This one puts the focus back in the right place, but loses a lot of the snazzy effects with the tree. Still, I could try a little postwork to fix that issue. Edit: Okay, so I did a little postwork on the christmas tree and edited it down into a more christmas-card form. I held back from making it a final submission only because I think the spotlight I used to light Sam is a bit too harsh on the floor to his left. I think I need to tone it down a touch, or add some fall off to address it. But this is how the final image will probably be laid out. Okay, I give in. I'm sure there must be a way to do this, but for the life of me I can't figure it out. I have a spotlight trained on Sam's midsection for one of the main lights. As is evident in the image above, however, there's an obvious 'hot spot' on the floor to the right where the light hits it. There's another one on the opposite side, though less obvious due to the weaker light. Now I'd love very much to minimize this effect or neutralize it entirely for a more natural effect. Any ideas? Spotlights don't seem to have any falloff settings. My current way of thinking is to shove point lights into tubes to direct the light and use that falloff effect instead. An easier method would be preferred though.